This book with concertina structure wraps around itself to form the cover. The book paper is Canson and is strategically slashed to allow an accordian folded light colored paper with text & illustrations to be woven through the concertina. 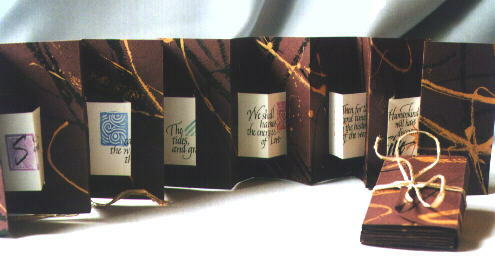 The text is lettered in italic and illustrated using hand carved rubberstamps appropriate to the text. The basic burgundy color of the book was enhanced with black and gold applied freely with a folded pen. The closure is 1/8" wire edged ribbon to tie.